The carving is elaborate and remarkable. Though worn with time, one can distinguisht the grains in the woods, the jewelry on people’s hands, and the folds of the dresses. On its own, it’s perhaps the finest statue in a cemetery full of wonderful carvings. Little seems to be known about the Di Salvo family. The monument states that it serves as the burial place for Angelo and Rosa Di Salvo, who died in 1932 and 1927, respectively. Though there are photographs of them included on the monument, almost nothing has been found about them in the public records. Unlike many other mysterious statues and graves (see our upcoming podcast an article about their Mt. Carmel neighbor, Julia Buccola), we don’t even seem to have any hearsay or legends about the family in this case. What we DO know is that the 1920s were apparently very good to them (well, if you don’t count the fact that Rosa died in 1927). As of 1920, Angelo and Rosa lived with three children, Anthony, Clementine and Cecilia, as well as Clementine’s five year old daughter, Lena (Clementine and Lena had a different last name, De Lucco; perhaps her husband had died). They rented their house at 255 De Koven at the time, and Angelo did some sort of work in a factory while Clementine waited tables. Angelo and Rosa had come to the United States from Italy some twenty years before. By 1930, however, circumstances appear to have been very different. Rosa had died by then, and Angelo was no long working at all, but he and Anthony were living in a $15,000 house (a very nice house at the time on Edgemont Avenue (near near what is now Roosevelt and Canal). Also absent, even from folklore, is what the statue is supposed to be OF, exactly. While many have noted that it looks like a 19th century family photo of some sort, what family is it? 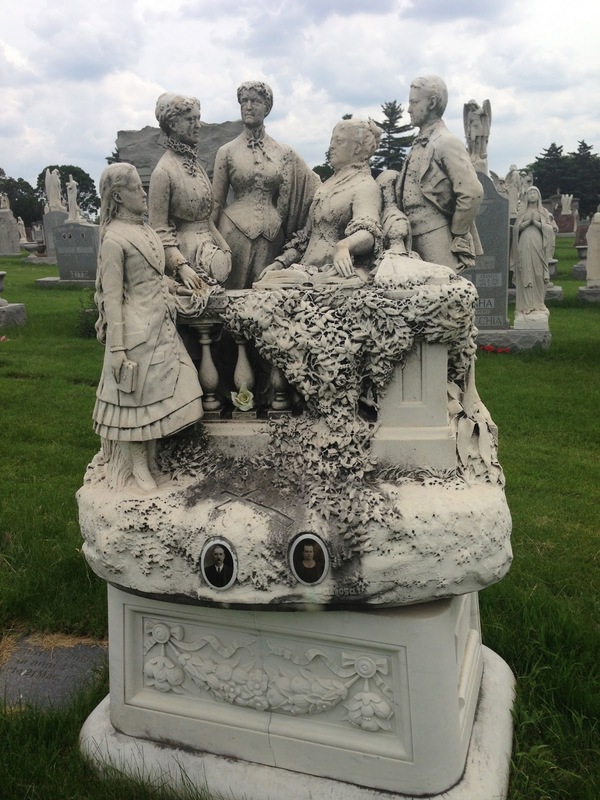 Are both Di Salvos buried here depicted among the five figures in the photo? Who are the others? And whose idea was the spinning monument, anyway? More information on the family and how their circumstances came to change so much in the 1920s would be appreciated!